Our Super Extra Large Virginia Peanuts blistered for that unique Diner crunch without the added salt for those who enjoy a heart-healthy snack. 36 oz. vacuum-packed tin. Added to the American Heart Association's® Heart-Check Food Certification Program. I order twice a year...everyone I know gets the best peanuts ever at Christmas! The unsalted peanuts are , by far, the best. Once you taste Virginia peanuts, you will not go back to your other brand. Even without salt, they are the crunchiest, tastiest peanut we have ever eaten. Perhaps the best review I can provide is my repeat order for these delicious peanuts. My uncle introduced me to them. He'd pick them up while traveling to Cape Hatteras, NC from his home in Roanoke, VA. We had them for snacking throughout the week, always disappointed when we ran out. These peanuts are so different from others I've had; they're larger, crunchier and more flavorful. I don't know what magic the Virginia Diner does to them; they are truly wonderful. My uncle prefers the lightly salted version, maybe I'm a purist but the unsalted ones are my favorite. We started buying VA Diner peanuts at the Sting Ray in Cape Charles and like them so well we now order them. Cute baskets come in handy for picking veggies. We ordered the 36 oz size Unsalted Peanuts. Excellent product. They are a delicious, healthy snack. We will certainly reorder when this can is empty. We love Virginia Peanuts. Our favorite!! I ordered these as a gift and they were delivered promptly and the recipient loved them. I order both the salted and unsalted peanuts for our office. Everyone loves the peanut flavor and the CRUNCHINESS! Everything arrives quickly and is well-packed. 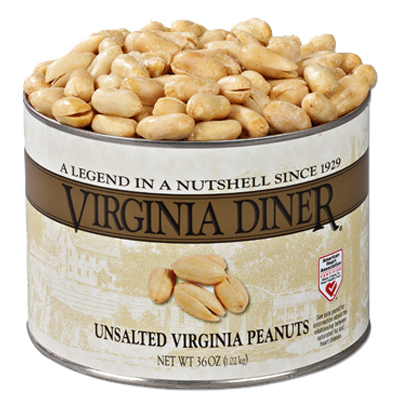 Virginia Diner has the best peanuts and other nut products on the planet. Been savoring them for years! Love the peanuts.!!! No where can you get peanuts as fresh, large, and tasty as the no-salt peanuts from Virginia Diner. Fantastic products, easy ordering, very dependable. A repeat customer forever ! Love your products and the most excellent customer service and follow-through. However, more no-salt products need to be available. What happened to the unsalted cashews? Please consider adding more heart healthy options! Hands down these are the finest peanuts I've ever eaten. They are a good size, very fresh, and cooked to perfection. You will never be able to eat any other nuts, after trying these. my office is hooked on them. My favorite in the world. I purchase every year throughout the year for myself as well as gifts! Everyone loves Virginia Diner peanuts!! So much better than national brands. Can't stop eating this stuff!Fresh and so tasty! My parents love the Unsalted Peanuts; very high quality, fresh taste. Owner Response: We are so glad you enjoy our peanuts, Ken. With ground transportation from VA to CA a full week, please be sure to place a reorder when you open your last can, that way you are never without! Thank you for the business and confidence in the Diner! Easy to use website, very good prices, fast service and excellent peanuts. I have wandered at times to other peanuts but always end up coming back to Virginia Diner. They are the best. I buy them when in town, get them shipped when home but plan never to run out. The best in every flavor tasted so far. Plan to keep working over the variety list for years to come. Thank you. everything is great...service and product. The product tastes so good. We have been a customer for decades. The nuts (unsalted/salted) are always a hit, and huge! The Tailgate Snack Mix is fantastic and loaded with the good stuff vs. fillers and not too salty. I have ordered multiple cans of peanut products from you for years. I'm disappointed every year because I have to open each box to find out what flavor is inside and then write it on the bottom of the box so I'll know to which person to give it. Product is always delicious so I put up with the inconvenience but hopefully you can somehow label the outside of the cardboard boxes in the future. Owner Response: We agree, Doug. We are keeping an eye out for a solution that works within our shipping setup. These peanuts are simply the best. A taste of home on the opposite Coast! Best nuts I've ever had! We've tried other brands of peanuts but always come back to Virginian Diner. These are absolutely the best peanuts I have ever had. I order these often. I wish they had a siracha ranch flavor.